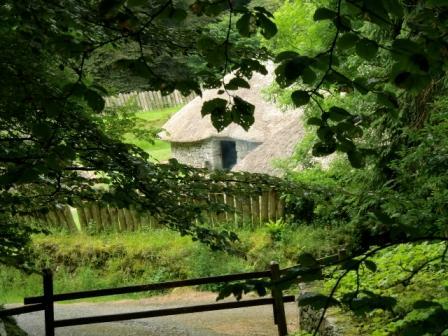 The Craggaunowen pre-historic park has both a 16th century tower house and an open air museum. The castle began in the 19th century and was completed by John Hunt, a medievalist, collector and antiquarian. He expanded the historical nature of the museum to include a recreation of an early Celtic settlement in Ireland. 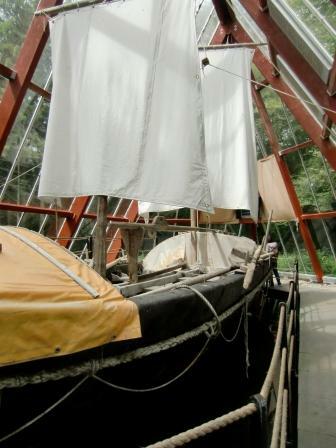 The open air museum includes a Crannog, a ringfort, an iron-age road, a hunter’s cooking site and a boat used to recreate the voyage of St. Brendan to the Americas. This castle is a tower house. There isn’t much to it beyond the tower. It was built in 1550. This was time of political change, with the English Tudor monarchs increasing their hold on Ireland. It was in this environment that Owen MacSioda MacNamara built the castle. It was one of many in Ireland. I don’t know where the MacNamara’s stood in the various conflicts of the age, but when the Irish Earls fled Ireland in the 17th century the castle fell into ruin. Luckily it is hard to ruin a castle that is mostly stone without much ornament. The Craggaunowen castle offers little that is unique. 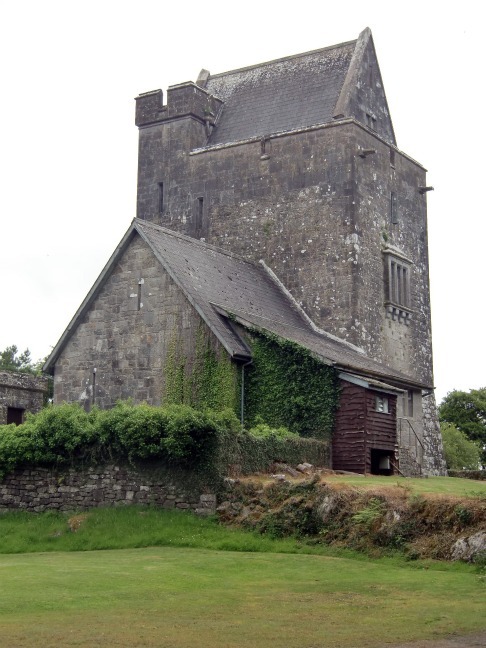 If you have already seen several Irish castles you may not get much out of a walk through the castle, but if this is your only castle you are seeing something that well represents how a good section of the aristocracy lived. It will help you be truly grateful for your cozy little house back home, and make you wonder why you would ever want to call it a castle. A crannog is a settlement built on an artificial island in a lake or marsh. The island was built upon logs sunk into the lake. Earth filled in and built up the island. It would be connected to the shore with a bridge or narrow causeway. The island would have a palisade surrounding it, along with the basic buildings for an extended family. There would be sufficient space for at least some of the animals they depended upon. It was a defensive arrangement for a rough time, when a man’s hard work could be stolen away by stronger neighbors. 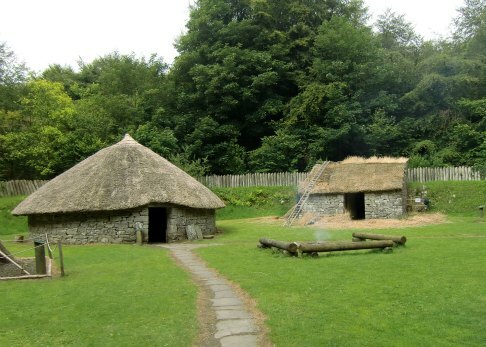 The Crannog at Craggaunowen has two large dwellings and some minor structures. You enter through an impressive tower gate. In the fields surrounding the crannog some recreated bronze age farming is going on, but, at least in 2011, not enough to be truly representative of what a family would need to survive. The houses are round, or at least oval and are mostly roof, or at least that is they way they appear to modern eyes. The walls are mud on woven wood framework. I can’t remember how tall the doorways are, but in these pre-historic dwellings they are often on the short side. It lets less heat out, requires a smaller covering, and is more easily defended. There is no chimney. You have to wait until the 12th century before you find chimneys in use. That means that the smoke leaks out of an opening in the top of the roof, but fills the upper reaches of the house with smoke. It wasn’t all bad. It was common to hang meat up from the roof supports in order to smoke it. The smoke also helped keep the bugs at bay. The thatched roofs were a natural place for bugs to reside, so the smoke inhibited their entry into the inside of the home. I do not have any pictures of the Iron Age Road at Craggaunowen. It was not very photogenic. It is simply a short section representing what they have excavated throughout Ireland. These are roads created by laying branches and tree trunks across boggy areas to create a hard surface for people and carts. In America’s Civil War, where they were called corduroy roads, they were often constructed by sappers as temporary roads upon which the armies would travel during the wet spring months. 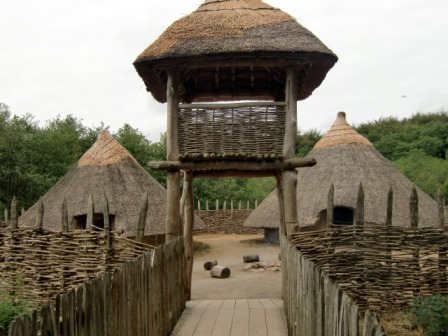 The ringfort is much like a crannog, but on land. It is simply a settlement with a wall around it. The walls were either wood palisades or stone, and Ireland has plenty of Stone. Often times they had a souterrain. A souterrain is simply underground corridors and rooms, often with an easily defendable exit beyond the walls. 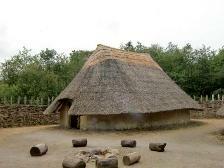 The dwellings are similar to those in the crannog, except the walls are stone. Since Ireland grows more stone than any other crop there was never a shortage and stone-walled dwellings are common in much of Ireland. Unfortunately stone isn’t a great insulator. The mud-walled houses had the advantage there. Clay mixed with grass makes decent insulation. 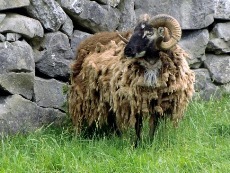 Craggaunowen is not an active reenactment farm, but I did see some sheep, and they have a collection of wild boars. 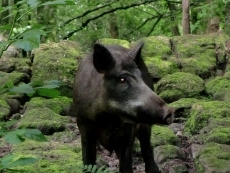 The boars are confined by an electric fence. Although they don’t look aggressive they can be quite dangerous, and very destructive of wildlife. They were very common throughout Europe. I think I way around a dozen boars, but I don’t know if I saw all of them. There is a dolmen at Craggaunowen. 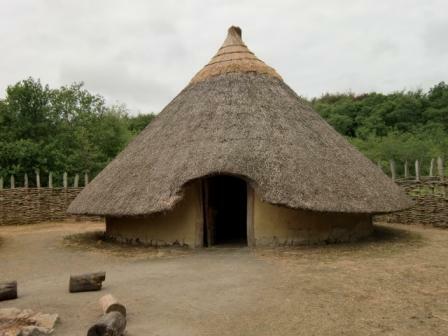 It doesn’t quite fit in with the bronze-age Celtic settlements at Craggaunowen. 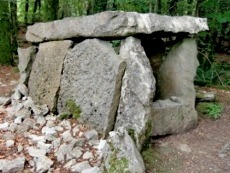 The dolmens originated in the stone age, but just as they form part of the landscape of modern Ireland they would have been around in the bronze age. They were probably burial sites and would have been buried to form a barrow. However it is possible that they had other uses. At another location I read that these cooking sites were part of the regular cooking arrangements, but I like the hunting party idea better. Basically it is a pit lined with rocks. It held water reasonably well. Off to the side the heated rocks in a fire. When they put them in the pit the water boiled. Then they boiled their meat. In the midst of the park is a large glass barn. Inside is a boat. Craggaunowen is nowhere near a large body of water. This was brought in as an added attraction for the museum. It is a ship created by the adventurer Tim Severin, who reenacted the voyage of St. Brendan. In 1976 he set off from Ireland and arrived in Newfoundland in 1977. The ship was designed to be very much like what was available in the early middle ages. St. Brendan was an Irish Monk who set off west in a boat with other monks. His adventures were circulating as early as 900 AD. St. Brendan sets off to find an island of paradise. Along the way he lands on various magical islands filled with strange creatures. He eventually returns and the Irish get the credit for discovering America and promptly forgetting where it was. The boat is impressive, but it was impossible to step back far enough away from the boat to get all of the boat in the frame. The glass walls were a little to close to the boat to allow for a good picture. Along with the boat is a video showing the story of Tim Severin’s adventure. I recommend visiting Craggaunowen. It is not an all-day affair. A morning or an afternoon will do. The price was reasonable, I learned some things and I had a pleasant nature walk with someone I truly enjoy spending time with. Do you have a great Park to recommend? Do have a great heritage village you want to tell us about? How about sharing pics of some we do know about?